The East of England RICS Awards 2017 showcases the most inspirational initiatives and developments in the region. Nominated in two categories, the Commercial Property award was presented to KLIC architects Fielden & Mawson at a ceremony in Bury St Edmunds on Wednesday 10 May. Built by RG Carters, and developed in partnership with New Anglia Local Enterprise Partnership and King’s Lynn and West Norfolk Borough Council, KLIC is the latest innovation hub to be delivered by Nwes, offering long-awaited state-of-the-art commercial workspace, business support, access to finance, and business events in West Norfolk. KLIC was one of three leading regeneration projects in the region and voted by RICS as the best Commercial Property. The award was the second accolade within a month for the flagship business centre, which opened in June 2016. 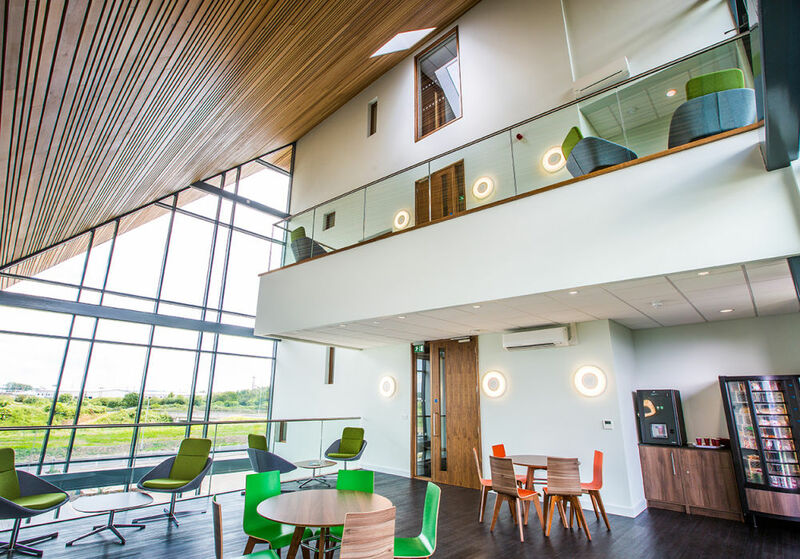 “We are delighted that Fielden & Mawson and the King’s Lynn Innovation Centre have been recognised by RICS East of England.” Nwes Strategic Director, John Balch says. Feilden+Mawson Partner, Philip Bodie comments. Services delivered by Nwes include high-calibre 1-to-1 business advice, mentoring and innovation support to accelerate business ideas. Additionally, Nwes can also provide access to financial sources and funding opportunities, providing the tools for local entrepreneurs and start-up businesses to flourish and further strengthen the local economy. The KLIC project has also been an exemplar of success through partnership and collaboration with particular thanks to Feilden & Mawson, RG Carter, New Anglia Local Enterprise Partnership and the Borough Council of King’s Lynn and West Norfolk. Read more about King’s Lynn Innovation Centre.